Christmas Ornaments Made in USA - Cobalt Blue Crystal Glass Two Inch Ornament Ball (set of 3) - A Christmas Ornament Co. 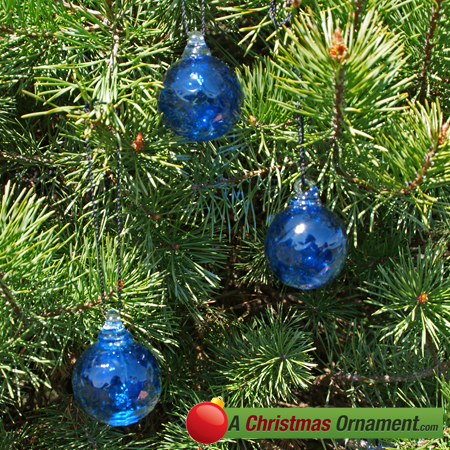 These beautiful cobalt-blue crystal-glass ornaments are part of a series of hand-made ornaments AChristmasOrnament.com is very proud to offer due to the quality of craftsmanship: it is extraordinary. All the hand-made ornaments we offer are of heirloom quality and will undoubtedly last for generations. Discover the near-extinct art of glass-blowing with any of the hand-crafted ornaments we offer. These glass ornaments are created using either the "free-blowing" process or the glass is blown into a mold. These cobalt ornaments are "free blown." This set of three Christmas ornaments are made by generations-old artisans with pride in the U.S.A. Each ornament measures two inches across.